Cwic a term referring to, “living” or “alive” in Old English, is the perfect name for this beautiful wooden four seasons tree by wodibow. This educational, fun and eco-friendly toy was designed to be an allegorical representation of the cycle of life. Children get to grow and develop the tree through the seasons, placing pieces together that represent blooming blossoms, the fruits of summer, snow covered leaves and vivid autumn days. Made with 58 solid beech wood pieces and magnets, along with eco-friendly water-based paint, the Cwic puzzle is safe and lovely for kids (but take care around tots still putting everything in their mouths due to the magnetic components) or as an adult-minded, ever-changing, art conversation piece. 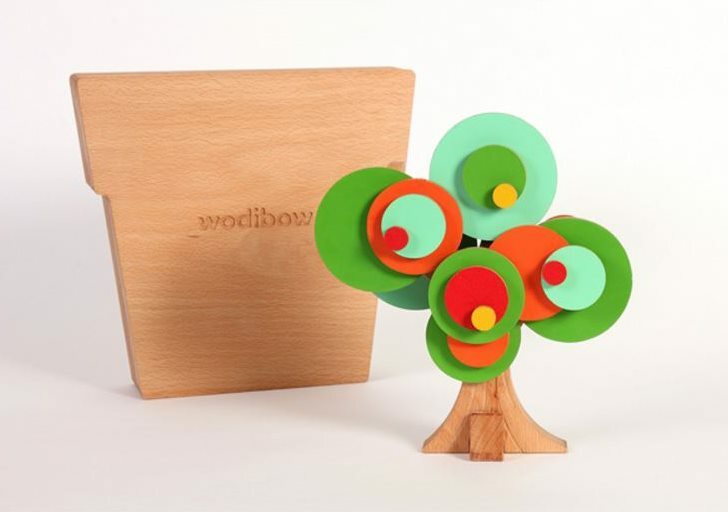 The entire tree comes packaged in a solid box carved from a single piece of wood in the shape of a flowerpot — and for each wodibow product that you buy, the company will give a donation to organizations that promote rainforest conservation. Cwic a term referring to,��living" or "alive� in Old English, is the perfect name for this beautiful wooden four seasons tree by wodibow. This educational, fun and eco-friendly toy was designed to be an�allegorical representation of the cycle of life. Children get to grow and develop the tree through the seasons, placing pieces together that represent blooming blossoms, the fruits of summer, snow covered leaves and vivid autumn days. Made with 58 solid beech wood pieces and magnets, along with eco-friendly water-based paint, the Cwic puzzle is safe and lovely for kids (but take care around tots still putting everything in their mouths due to the magnetic components) or as an adult-minded, ever-changing, art conversation piece. The entire tree comes�packaged in a solid box carved from a single piece of wood in the shape of a flowerpot -- and for�each wodibow product that you buy, the company will give a donation�to organizations that promote rainforest conservation.